Multinomial goodness of fit tests compare frequencies of the levels of a qualitative variable to theoretical frequencies. 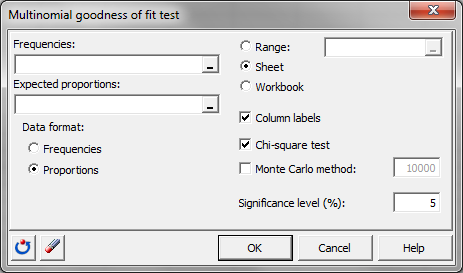 In Excel using the XLSTAT software. 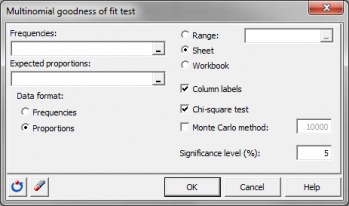 The null hypothesis of the test writes: H0: The distribution of the values in the sample is consistent with what is expected, meaning that the distribution of the sample is not different from the distribution of X. The alternative hypothesis of the test writes: Ha: The distribution of the values in the sample is not consistent with what is expected, meaning that the distribution of the sample is different from the distribution of X.